Earlier this year scientists discovered a new hypervelocity star travelling close to the earth. According to researchers from the University of Utah this star can give us new information about about the black hole. 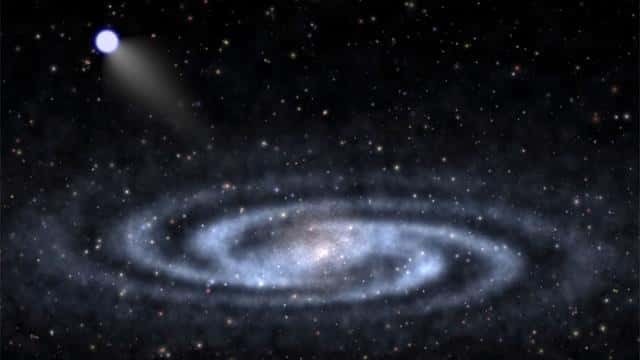 This hypervelocity star is one of 20 that have been discovered. It was discovered closer to earth than any of the others . Scientist say that it is the second brightest of those that have been found and also one of the largest. ^This is an artists impression of a hypervelocity star. The star was discovered in May of 2014 and it is important to researchers because the speed and trajectory tell scientists a lot about dark matter. Hypervelocity stars are stars that have traveled too close to the black hole in the center of the galaxy. They are formed when pairs of stars orbiting each other get too close to the black hole. When this happens one star is captured by the intense gravity of the black hole and the other is slingshots out of the galaxy.